I’m working with a great client who is in the midst of moving and redoing her decor. She has a relatively new bedroom set and wanted to change it up for her new home. 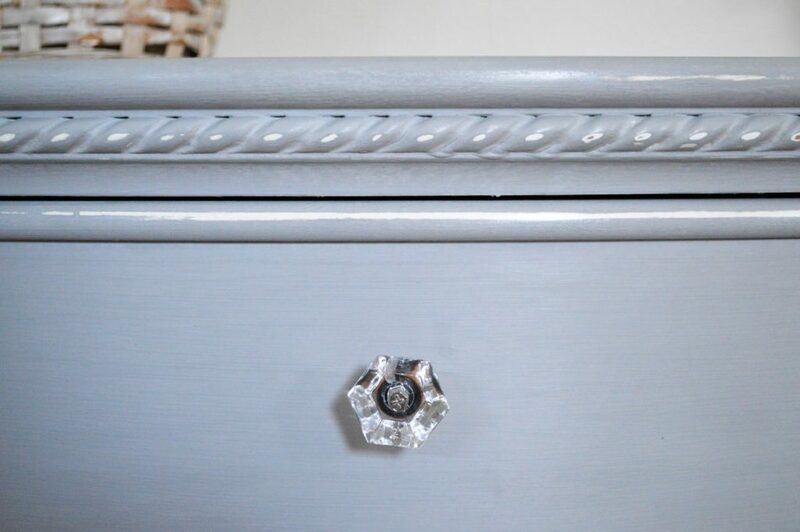 We decided on Paris Grey with light distressing and glass knobs to give it charm and glam. 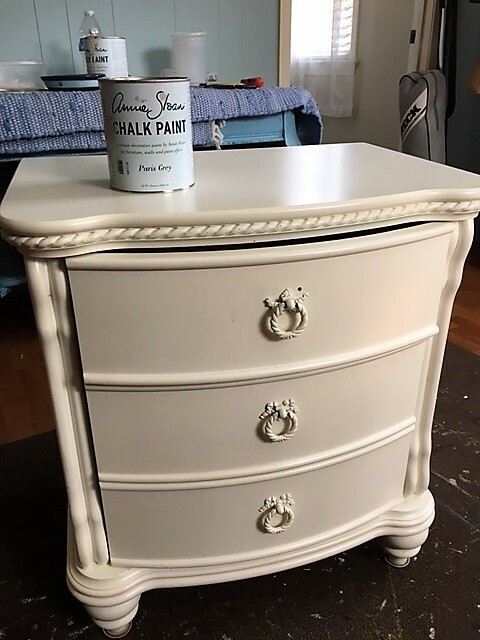 I just finished the nightstand and it is SO pretty that I had to share it with you all. 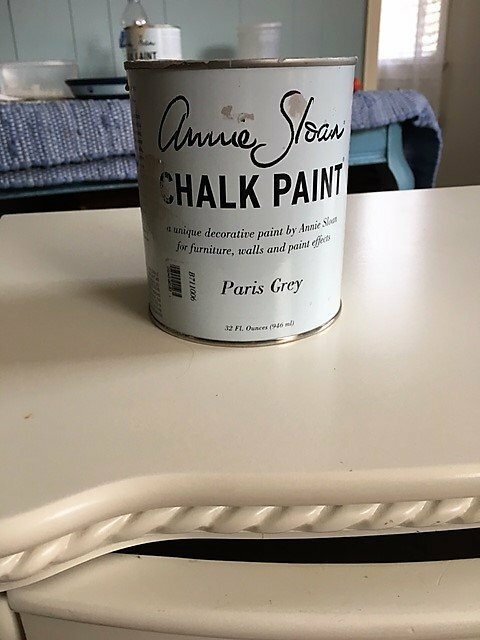 It shows how Annie Sloan paint can give even the newest pieces charm. Here is the before. It is already very nice but kind of boring with the flat, new, off-white finish. 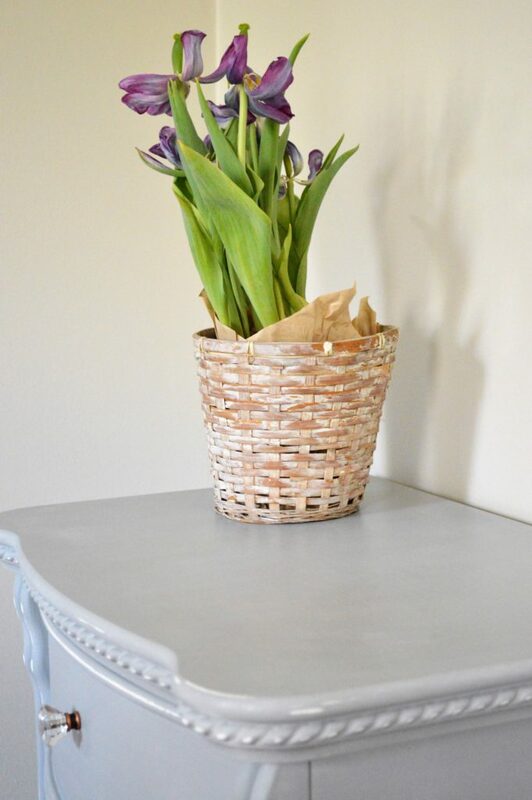 It took three coats of Paris Grey to cover completely. I then used 220 grit sandpaper to smooth it out and lightly distress. The next step was sealing it with Annie Sloan Clear Wax and adding the new glass hardware. Here it is now! I’m working on the matching dresser soon as well as the prettiest little shelf that goes above and will hopefully share soon! 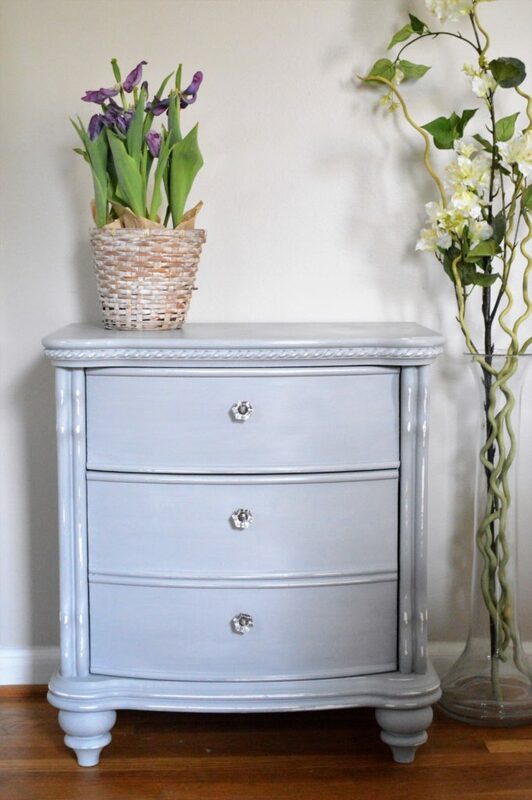 For more pieces finished in Paris Grey, click HERE (Paint Color Highlight, Annie Sloan French Linen and Paris Grey)! How do you get that smooth semi-glossy finish? My pieces always look so flat! 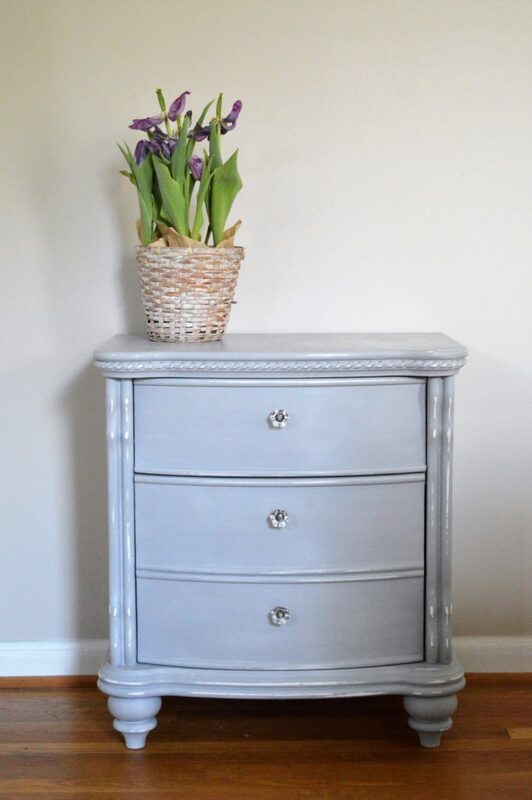 This is a gorgeous nightstand-love Paris grey. Hi Teresa, It’s all in the sanding. I’m going to do a post on it soon! When they’re done. Such a calm, soothing color. 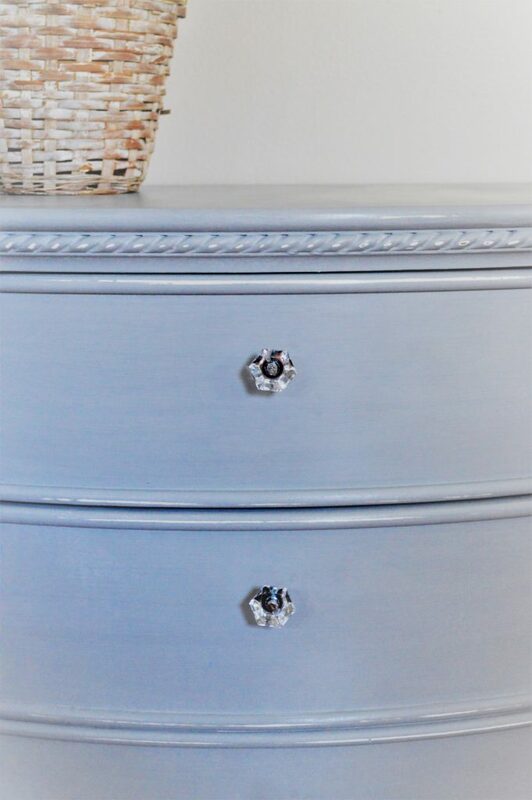 Hi Mary, Yes, Paris Grey is a very pretty, soothing color – perfect for bedroom furniture! You do such beautiful work. Mine never is smooth like yours. I use a little fine grit sandpaper between coats and some steel wool before waxing for a smooth as can be finish. I think, too,that sometimes we don’t buff that wax enough. The fine grit sandpaper is key. You can also sand after waxing for a super smooth finish ? 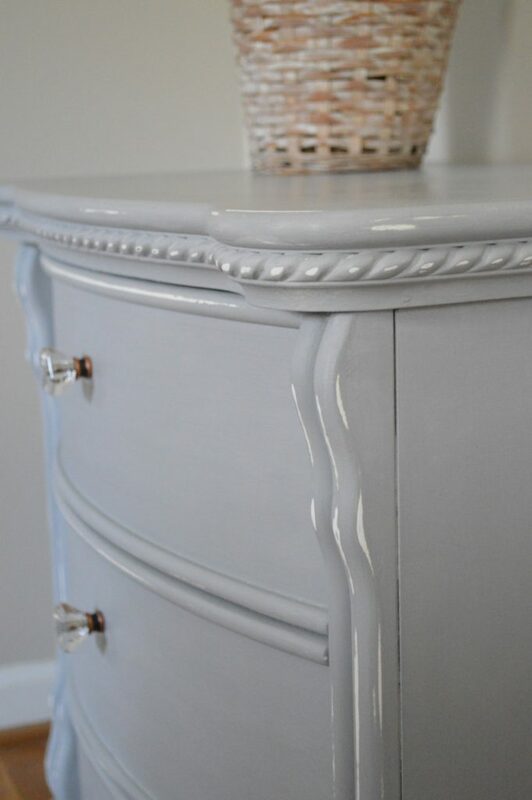 I love how paint is so transformative (not sure that’s an actual word..lol) Beautiful make-over Suzanne.